After your divorce, your credit score can go a long way toward making your transition a little easier or a lot more difficult. Your credit score will come into play if you want to refinance your home to get your ex-husband off the mortgage or if you want to rent an apartment after you’ve moved out. Need a new car? Your credit score will determine your interest rate or even if you get approved for a loan at all. Have to go back into the workforce? Many employers check the credit reports of job candidates. A good credit score means that you’ll be approved for the loans you need and could save hundreds a month on lower interest payments! Here’s how to start nudging your credit score up before your divorce. Many banks also offer free credit score reporting to their customers, and you can find multiple organizations that offer free credit score reports. Some of these agencies will try to sell you monitoring services or will charge you to view your credit scores after a free introductory period, so proceed with caution! Review your credit reports from each of the three major agencies and look for mistakes. Unfortunately, mistakes are staggeringly common. According to the Federal Trade Commission, as many as 42 million Americans have errors on their credit reports! These errors could negatively impact your credit. If you do detect a mistake, reach out to the credit agency at once and work to get it fixed. Here is an article from the Federal Trade Commission on how to dispute credit report errors. The thing that will hurt your credit score more than anything else is delinquent payments. Your credit reports will show you if any creditors have flagged you for a late payment. It isn’t uncommon for spouses to discover that their credit score has dropped because the other spouse didn’t make a payment on a joint account. Even if your husband is supposed to be paying off the account, don’t let the late payment fester. Find a way to pay it off. 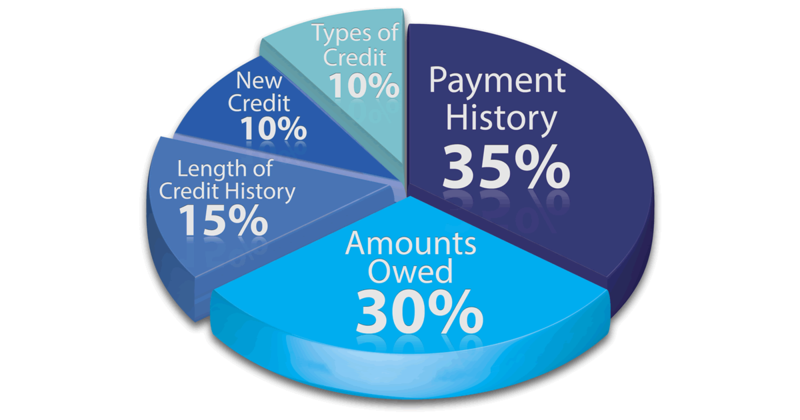 According to Equifax, your personal payment history accounts for 35% of your credit score. You can’t change what you did in the past, but at least you can start making payments on time moving forward. If money is tight, at least ensure that you are making the minimum payments on each account. Equifax suggests that 30% of your credit score is related to used credit versus available credit. If your credit cards are nearly maxed out, this will hurt your credit score. If your divorce is still some months away, make an effort to begin chipping away at your debt. At a minimum, try not to accumulate new debt. This credit card will also come in handy when you start the divorce process, as you’ll have a card that your husband can’t cancel that you can use to cover your expenses! Depending on your situation, you may need to take the radical step of closing joint accounts. For example, if you and your husband have a joint credit card, but he is the only one who uses it and he is constantly late making payments, then his actions are hurting your credit and will make it harder and more expensive for you to start your new life. Also, if you suspect that your husband might not take the divorce well, it may be a good idea to close down joint accounts now so he can’t sabotage your credit. (Yep, this has happened.) It’s best to discuss closing down accounts with your husband first so there are no surprises. Planning for a divorce is stressful, but don’t overlook the need to protect and improve your credit. A strong credit score can go a long way toward opening financial doors for you as you start building your new life!